Dewey was here for more than a year. Some of us were getting a little worried that no one would want Dewey. He was such such a good boy and well-loved here at the shelter. 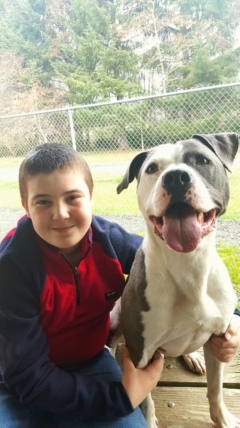 “Dewey is a very handsome four-year-old male Pit-Bull Terrier Mix. He seems to be good with other dogs and people of all ages. Dewey likes to chase cats, so a home that is cat free would be best suited for him. He will also need a fenced yard. Dewey came into the shelter because his people didn’t have the time needed for him that he and all pets need and crave. Dewey is very playful and loves interaction with all. 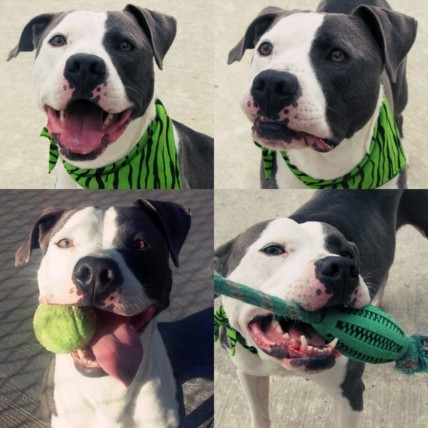 Dewey has a lot of energy and would do best in an active home. He would make a great beach walking, hiking dog and a great companion. (Some further leash training would benefit Dewey for a perfect fit).